Common Nighthawk over Wausau, Wisconsin, August 22, 2013, by sfisher. Peent! That raspy call fills the evening — loud enough to be heard over New Orleans street music or Chicago Loop traffic yet soft enough to be tuned out, unlike the insistent whip poor will! calls of its close relative. It’s easy to fall asleep in a tent as nighthawks dance in the sunset sky. I first discovered Common Nighthawks on the evening of June 23, 1975, in the parking lot of the Natural Resources Building on the Michigan State University campus. I was a young student at the time, intending to keep my husband company while he did research. But these lovely birds, with their ethereally long, graceful wings marked with a crescent moon, flying in and out of the glowing halo of streetlights, mesmerized me. Hours later, my husband found me still staring up in wonder. Twice as I watched, a male nighthawk had suddenly plummeted out of the sky at breakneck speed straight for the pavement. Both times he abruptly seemed to come to himself, as if realizing he was about to hit asphalt, and screamed out augh! as he pulled out at the last moment. It wasn’t until the next day, at the university library, that I learned about the male’s “booming display.” That augh! wasn’t a scream at all — it was produced by air rushing through his primary wing feathers after a sudden downward flexing of his wings during what was apparently a courtship dive. The more I watched and read about nighthawks, the more fascinated with them I became. Another night I spent many hours watching a pair hawking for insects in the glow of a light illuminating the oversized American flag at a Perkins restaurant. A brisk wind made the heavy flag flap while the nighthawks moved up and down and in and around, managing to catch hundreds of insects while ever eluding the erratically moving fabric. I watched them aim for and eat sizable moths and many tinier bugs — it was surprisingly easy to follow them with binoculars as they remained in the relatively small cone of illumination. The species’ characteristically erratic yet graceful flight is moth-like in purpose, as nighthawks swoop and dart through the sky in pursuit of lepidopterans and other insects. Denizens of the dark or, more accurately, of twilight, nighthawks are closely related to owls, with similarities in DNA and many morphological structures as well as plumage. Indeed, the late Roxie Laybourne, the Smithsonian authority on bird feathers, once told me that under the microscope, nightjar feathers are almost identical to owl feathers. But unlike their raptorial cousins, nighthawks have shied away from a grasping, seizing lifestyle. Rather than wielding huge, lethal talons, a nighthawk has flat feet that are among the smallest and weakest, relative to its size, in the bird world. Its flattened, blunt claws do little more than balance the bird on fairly flat surfaces and help it run short distances with unexpected grace and speed, like an unusually short little plover. The middle toe sports a pectinated claw — a claw with a comb-like inner edge. I’ve had the wonderful good fortune to care for many nighthawks during the years I worked as a licensed wildlife rehabilitator, and I often saw tiny down feathers caught in this “comb,” which apparently does serve, as we might guess, as a grooming tool. If a nighthawk’s feet are harmless and ineffectual, its bill is even more rudimentary, having little function except to hold the bird’s nostrils in place. Rather than killing prey with beak or claw, a nighthawk simply flies straight into bugs with its capacious mouth and throat wide open. The sides of the mouth are soft and flexible, the mandibles resting too loosely at the center top and bottom to be capable of grasping anything. Nighthawks feed entirely by flying into insects at foraging speeds, measured in one study at 5.3 meters per second (about 12 miles per hour) and, in another study, at 8.9 to 15.6 meters per second (about 20 to 35 miles per hour). This is fast enough that insects go straight down the hatch, meeting their deaths by contact with internal digestive juices rather than external killing structures. The nighthawk’s tiny vestigial tongue set at the very back of its mouth probably has little or no tasting function; food whizzes past too quickly to rest on the tongue and too fast for the bird to reject at the last moment if it doesn’t like the taste. A nighthawk’s feeding technique is certainly effective. In one analysis of the stomach contents of two nighthawks, queen ants represented 25 percent of the birds’ entire body masses; in another study of 87 nighthawks, there were 200 to 1,800 flying ants per stomach; another study found 2,175 flying ants in a single stomach. Apparently, nighthawks are at least somewhat selective in taking prey: One researcher found that Trichoptera (caddis flies), Coleoptera (beetles), and Hymenoptera (bees, wasps, and ants) were selected over other potential prey species emerging from a river in British Columbia. As common as nighthawks are — found in cities and rural areas alike and frequently nesting on university and college campuses, often on the rooftops of the buildings housing ornithology departments — enormous gaps remain in our understanding of the species. I pieced together information from ornithology textbooks and old morphology books to learn that where the large and small intestines meet (where our appendix is), gallinaceous birds, nightjars, and some other birds have paired, blind offshoots called caeca. In the Ruffed Grouse, these caeca grow enormous in winter and then shrink in spring. Within the caeca are bacteria that produce an enzyme that breaks down cellulose, enabling grouse to digest the woody tissue in aspen buds, their primary winter diet. The nighthawk’s limited eating options — it can only swallow prey whole in flight — doom to starvation a bird with a sprained or broken wing. On the ground, the most succulent moth could walk right in front of the hungriest nighthawk, barely a millimeter from its beak, and the bird could do nothing but watch, hoping that the moth would walk in. When I rehabilitated nighthawks, I was amazed to see just how helpless and unable to feed themselves downed nighthawks really are. When I first received a bird, I’d have to tease the fragile mouth open to place food inside. Within days, most birds would run up to me, mouths open, to be fed, but no matter how long I had one, I could never teach it to feed itself. This was not because nighthawks lack intelligence but because they lack the physical structures necessary for self-feeding on the ground. I’ve found only one rehabber who said she’d been able to get a flightless nighthawk to self-feed. And even after nighthawks learn to open their mouths to be hand-fed, many adults can’t swallow food items on their own for days or weeks longer — after placing a food plop into a bird’s mouth, I’d have to stroke its throat to help ease the food down. I did this until the throat muscles, apparently not used since it was a chick being fed by its parents, got back in shape. If cryptic coloration or hissing and raising wings doesn’t work and flight is impossible, nighthawks do have one final trick up their sleeve, as many banders have noticed — they evacuate a large, foul-smelling, messy caecal dropping on their captor. I’ve never witnessed a fox or other predator picking up a nighthawk, but I wonder if that experience might not make one reluctant to ever look at another nighthawk. Although once a very common bird, the Common Nighthawk seems to be declining. Virtually every birder I’ve discussed the matter with says nighthawks are far less common than he or she remembers. I remember streams of nighthawks flowing along the Lake Superior shoreline on August evenings; on August 26, 1990, one experienced counter, Mike Hendrickson, tallied 43,690 in a two-and-a-half-hour period from a vantage point north of Duluth. Since then we’ve documented many migration nights numbering in the hundreds and a few in the thousands, but none of that order of magnitude. Nighthawks are more difficult to survey than many other species, but Breeding Bird Surveys do show a significant decline in the United States and Canada, both in the long term (from 1966 through 2003) and in the short term (from 1980 through 2003). Canadian researcher J. 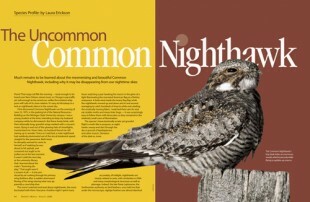 A. Wedgwood conducted a thorough survey of Common Nighthawks in the city of Saskatoon, Saskatchewan, in the summer of 1971; when he repeated the survey in 1990, he found a 42 percent decrease. “Attracting Birds” by Laura Erickson. The wonder of the Wichita Mountains: Black-capped Vireo. What factors are contributing to the decline? In 1991, Wedgwood found that the decrease in the Saskatchewan population coincided with nonselective pesticide-spraying programs for mosquito control. Nighthawks are dependent upon emergent aquatic insects, so whether or not the pesticides are directly toxic to the birds, they are certainly responsible for reducing the birds’ prey base. Burgeoning populations of crows and Ring-billed Gulls in cities may also have contributed, since both species feed on eggs and chicks. In rural areas, nighthawks nest on burns, scrapes, and other patches of bare ground. In urban and suburban areas, they nest on the flat roofs of buildings. Rock-ballasted roofs — those covered with tar paper held in place by rocks — are ideal. But construction methods and materials have changed, and now many rooftops are clad in rubberized asphalt, which gets so hot that rehabbers and banders have documented nighthawks with blistered feet; obviously, this type of roof can get too hot for eggs or chicks to survive. Maine researcher V. Marzilli found that gravel pads set in the corners of these rubberized roofs can provide suitable nesting sites. Nighthawks are also killed by cars, both on gravel roads when roosting and on paved roads, especially while swooping for insects detected in headlight beams. And nighthawks, especially adult males during courtship, collide with telephone and power lines. We also need to learn exactly where in South America nighthawks winter and what their habitat needs are there. 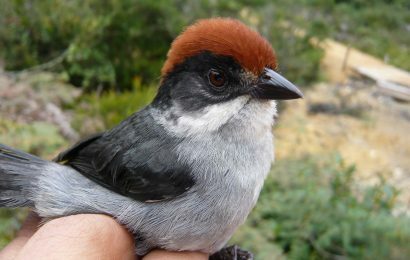 Both research and dedication will be necessary to bring the species back to its former numbers. For the past 30 years, I’ve found nighthawks fascinating, mesmerizing, puzzling, and beautiful. But what made my passion for nighthawks grow into genuine love was one particular nighthawk, Fred, who came into my life in June 1991. 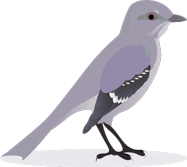 A collision with a power line had left Fred, an adult, with a permanently damaged wing, and I was licensed to keep him as an education bird. For six years, I took him to schools and Brownie Girl Scout meetings and nursing homes, and everywhere people were struck by his shy, gentle ways. Had I just read To Kill a Mockingbird when he arrived, I probably would have named him Boo. But at the time he arrived, my young children and I were watching Mr. Rogers’ Neighborhood every day, and everything about the bird reminded me of Fred Rogers, from his flat, soft feet — an avian version of Mr. Rogers’ sneakers — to his calm, placid manner. Fred was patient with children — in gymnasiums packed with Cub Scouts, he’d sit quietly as each child inspected him. Sometimes he grew tired of being on display, but he never tried to flee; he simply turned his back to the room and gazed into my eyes, giving me a pleading look. That was my cue to pull out his carrier, where he quietly retreated. But like Mr. Rogers, he always gave the children at least a half-hour before it was time to leave their neighborhood. I hand-fed Fred many times a day the six years he lived with me and kept him in the same room with me most of the time. His favorite perch was a sunny windowsill, a foot off floor level, where I’d place him after his breakfast. Throughout the day he moved like a sundial, facing east in the morning and little by little rotating his body until he was facing west at sunset. But as darkness fell, Fred always jumped from the window and retreated to his carrier under my desk for the night. At the time, I sometimes served as hawk counter during the month of August at Hawk Ridge Nature Reserve in Duluth. August is the month when hawk migration makes its slow start, when a good day is measured in dozens or, more rarely, in hundreds rather than thousands of hawks. I’d sit on a lawn chair at the main overlook scanning the sky diligently while Fred basked in the sun at my feet. Sometimes a low-flying Red-tail sent him in quiet retreat into his pet carrier; the moment that danger had passed, out he’d come again. We’d sit together companionably, the hours passing. Once in a while, Fred would make a soft rit rit rit call. I’d survey the sky with 10-power Zeiss binoculars, and, sure enough, so high up I could never have detected it with my naked eyes, there was a hawk or eagle. Every time I heard Fred make that alarm call, I found a hawk flying exactly where he was looking. It was a vocalization I’ve never read about in the literature; but then again, it was a vocalization I’ve never heard given by a wild nighthawk. I have no idea how old Fred was when I got him, and so I have no idea how old he was six years later when he developed a respiratory infection and died in my hands. Like Mr. Rogers, my Fred had been a splendid teacher, giving me insights into the quiet, gentle neighborhood of nightjars, these gentlest of obligate predators, consigned to a body that can’t digest plants yet can’t rip into animals. In my heart I promised Fred that I’d do what I could to prevent other nighthawks from crashing into wires and losing their ability to dance in the sunset sky, scream augh! with their wings in that exuberant courtship flight, and fly from hemisphere to hemisphere with the seasons. Sometimes we birders and conservationists feel powerless to protect the birds we love. But working together, we’ve almost certainly saved the Whooping Crane from extinction, and we may well ensure that long into the future children will look up in wonder at delicate birds sporting a crescent moon on slender wingtips, fluttering about in the evening sky. 1. Nighthawks are closely related to owls, with similarities in DNA and many morphological ­structures as well as plumage. 2. 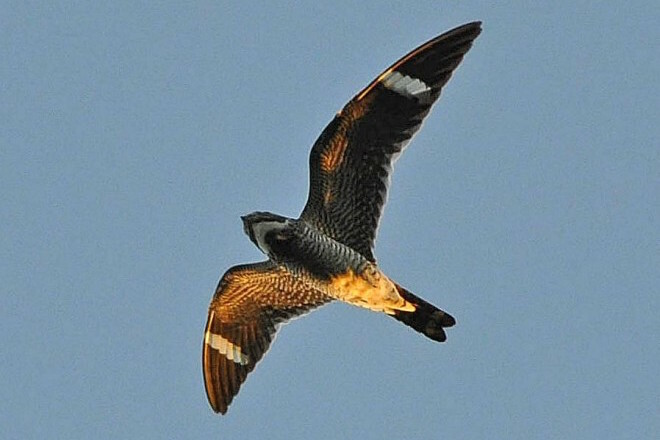 A male Common Nighthawk’s familiar “booming” sound is produced by air rushing through his primary wing feathers. 3. A nighthawk’s feet are among the smallest and weakest, relative to its size, in the bird world. 4. The sides of a nighthawk’s mouth are soft and flexible, not rigid. 5. Nighthawks do not seize their food in their bill or feet; they feed entirely by flying straight into bugs with mouth and throat wide open. The insects go straight down the hatch. 6. Downed nighthawks are helpless and unable to feed themselves. 7. Virtually defenseless against predators or other enemies, ­nighthawks rely on their cryptic ­coloration for safety. 8. About once a day, nighthawks produce a foul-smelling, brown, liquid dropping that is different from their other droppings and from the droppings of most birds. Ornithologists can’t say why. 9. Breeding Bird Surveys show a significant decline in the United States and Canada, both in the long term and the short term. 10. Nighthawks nest on buildings in urban and suburban areas. Flat roofs covered with tar paper held in place by rocks are ideal. 11. Nighthawks and their relatives are nicknamed goatsuckers, because their mouths appear large enough to milk goats. (They absolutely cannot live up to this name.) 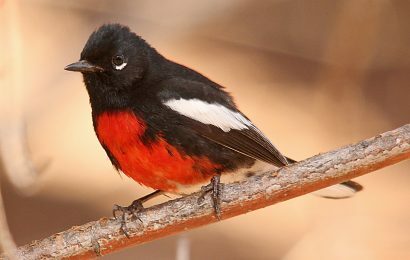 The birds are also known as bullbats, because of the ­roaring sound that the males make in their courtship display. 12. Nighthawks usually sit parallel rather than perpendicular to branches. This may simply be more comfortable on their flat feet, but it also helps enhance their cryptic coloration by orienting them like typical branches. Of course, nighthawks don’t eat wood at any time of year, so why would they have caeca at all? 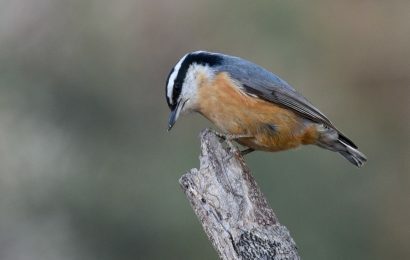 Based on the smell, I suspected that a bacterial process must be involved, and I wondered if the bacteria in the nighthawk caeca might produce an enzyme that breaks down chitin, allowing the birds to extract nutrition from insect exoskeletons and the hard wing covers of beetles. I wrote to nighthawk researchers asking for their insights, but few had ever noticed the peculiar droppings. (One Smithsonian scientist who had done extensive research on captive nighthawks suggested that perhaps I was a keen observer of such things because my children were in diapers!) Nothing had been published about the function of nighthawk caeca, and no one knew anything more about it than I did. 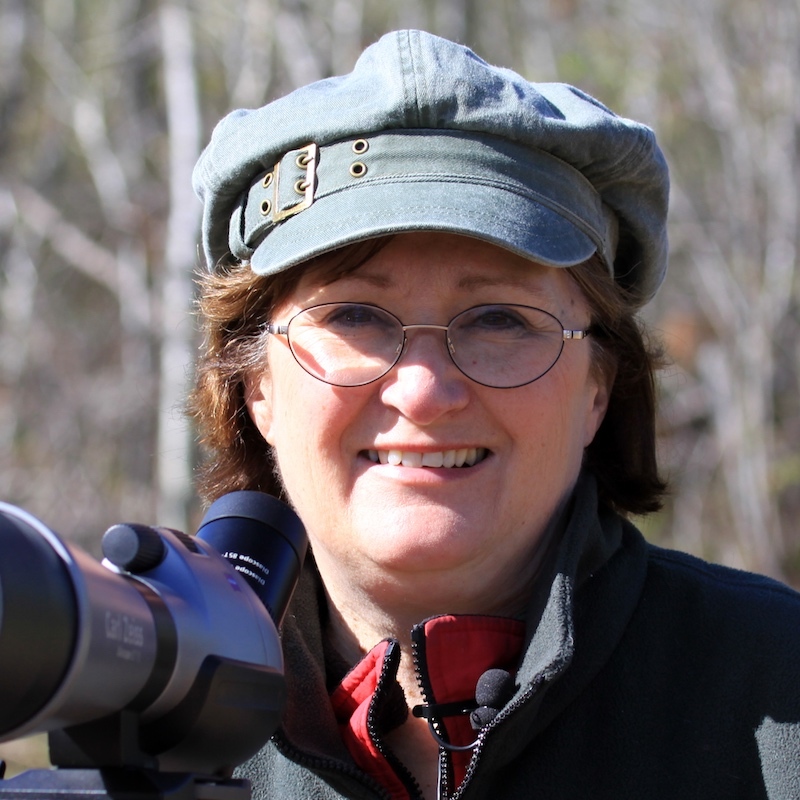 Laura Erickson is a BirdWatching contributing editor. Her column Attracting Birds, about attracting, feeding, sheltering, and understanding the birds in your backyard, appears in every issue.